Alright my blog friends, I have decided to call this feature just The Ramble. Because I may not have enough to share each week, this will pop up every so often when I have some fun news. Well due to my parents being out of town for the official birthday celebrations, we opted to do a belated dinner and festivities. It just so happened to be during the restaurant week in DC. YEP, that makes two weeks of participating in restaurant weeks! Check us out!! We started the evening in Georgetown at Filemona. Yummy!! A great higher end Italian spot with unique decor and a jam packed menu. This was my yummy dessert - thanks to a doggie bag, I had room for it! 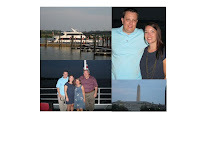 Then thanks to Groupon we headed to a Potomac Harbor Cruise that departed near Nationals Stadium. It was such a great time to see the monuments and other sites from a different point of view. I would definitely recommend the ride to anyone visiting or living in the area. Happy belated birthday! Looks like everyone had a wonderful time.